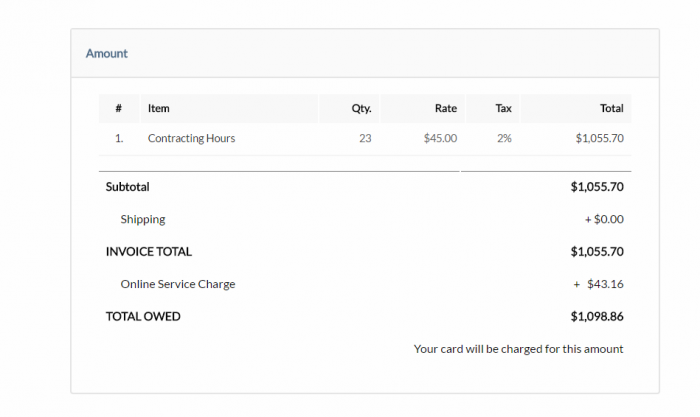 Recently we added a service charge capability to our custom payment forms (Learn More Here). Now we have also added this feature to our invoices. It is an optional service charge added to the total amount of the invoice. The service charge can be used to recoup all or some of your transaction fees. If a the service charge is enabled on an invoice, a note will be added to the invoice email sent to the customer mentioning that a service charge will be applied to online payments. The invoice payment form will display the original invoice total, the amount of the service charge based on your settings, and also the new total which includes the service charge. You can now view a copy of the emailed invoice so you know exactly what was sent to your customer. Invoices can now be deleted completely. The ability to cancel an invoice still remains. Canceled invoices remain in your invoice records, while deleted invoices are removed. We have upgraded our invoicing system so that invoices can now be paid offline. For any offline invoice payments, you can simply click on the invoice actions button for that invoice in Paycadence and choose the ‘Mark invoice as paid’ option. This will create a manual transaction entry for your records.